If you’re reading this post, you’re probably aware of the dangers of Flash Player. And you’ve read, most probably, about the last couple of viruses / penetrations to Facebook and Google. Steve Jobs hated Adobe Flash… personally, i say he had a very good reason. If wasn’t, probably, just because Adobe refused (at first) to publish its suite for Mac. He knew that it was troublesome… so… let’s proceed removing that junk from our system!. 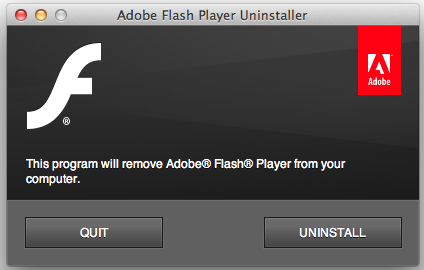 If you’re running Snow Leopard (or newer), you’re gonna need to download the Flash Player Uninstaller. However, if you’re running an older version (Leopard and Tiger), please, download this uninstaller. Congratulations! welcome to the future!. HTML 5 is becoming the web standard… and we certainly don’t need Adobe to run anything on a browser. Previous PostHuman Brain Project: Real Artificial IntelligenceNext PostApple Got Hacked! ?